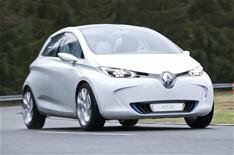 Renault Zoe reader review video | What Car? The all-electric Renault Zoe is a conventional five-door supermini, but one that manages to combine its real-world appeal with funky, futuristic styling. It's affordable, too just 13,650 for the entry-level model and thanks to the under-slung battery, it has a proper boot. Could this be the electric car that makes battery-powered motoring an everyday reality? We took a group of What Car? readers to Paris for an exclusive preview. Find out what the What Car? readers thought about the Zoe, and don't forget to browse the rest of our Reader Test Team videos, too.